It has been 5 years since my last official release, Mechanical Uprising. So, what have I been doing the last 5 years? 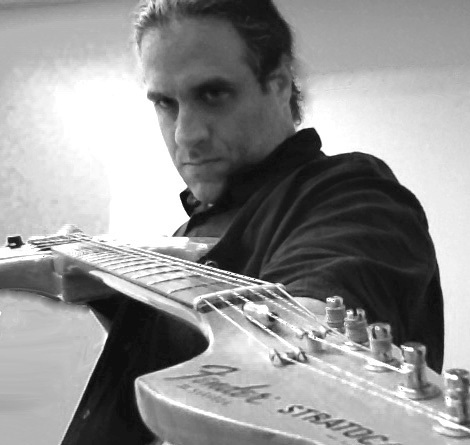 Besides working on this new release, I made a few contributions to some top-notch electric guitar driven compilations (Axe – Various Artists, $100 Guitar Project – Various Artists ), recently finished a commission for the NYC Guitar Orchestra and participated in various other musical activities. And although I didn’t perform live much, I played and taught a lot. All that while being a Dad to a 5 year old girl which is its own wonderful and challenging thing. The initial plan was to release a full-length album of new music using the same instrumentation throughout: electric guitar, electric bass, virtual instruments (piano), percussion samples and voice samples (once again, courtesy of my wife, Kim) but while working on the album, I reached a point where I felt I had said enough. 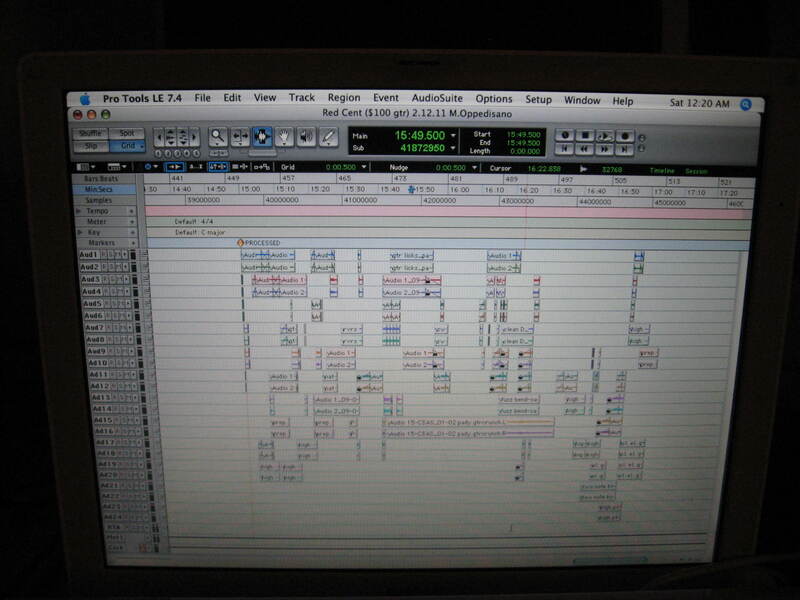 A short piece which I originally composed for the album didn’t make the cut, so it was left off. (The piece can be heard online: Yawp). Call me old-fashioned, but I still believe in the album concept and this EP is the most consistent compared to my other releases. Why include more music for the sake of it? This EP also has the least amount of guitar than any of my other albums, even though I still play lots of guitar and have thought about doing a solo guitar album for years now. Talk about a complicated relationship.. Ultimately it doesn’t matter how much guitar is in my music as the music itself matters the most. Truth. So, I bring you, Resolute. Hope you like it. Special thanks to Bruce Hamilton of Spectropol Records for his ongoing interest in my music and for including this release on his label. For the last two years or so, I’ve spent some time improvising for solo electric guitar. These improvisations are spur of the moment, a kind of of thinking out loud – a process maybe leading to something more structured in the future. I enjoy it and it’s a healthy contrast to the sometimes obsessive nature that occurs (for me at least) during composing and recording. The improvisations are free-form and tend to focus on a particular scale or mode with some bluesy playing included (no matter where I’ve gone creatively in my life, I always return to some form of rock/blues playing). So, there is no emphasis on swing or improvising on a tune like in a traditional jazz improvisation. I’m just plugging straight in, letting my fingers and ears go, focusing more on the sound of the instrument, with emphasis on articulation, dynamics and expression. As the years have passed and having become known as an electroacoustic or experimental composer/guitarist (with 4 albums to date), I’ve gradually become more interested in conventional guitar technique and tuneful in my note selection in general. I’m also interested in making some serious noise, and yet be able to play traditionally, melodically and beautifully too. Come to think of it, these solo improvisations might be part of the process for that solo guitar album I’ve thought about making for quite some time now. Now, for a few videos of my improvisations. In April 1984 at the age of 12, I picked up my father’s beat up acoustic guitar and set out how to learn how to play it. Up until I started guitar, I had dreamed of being a professional baseball player. Personally, I didn’t care for winning and losing, so I stopped playing organized baseball. Music seemed the way for me. 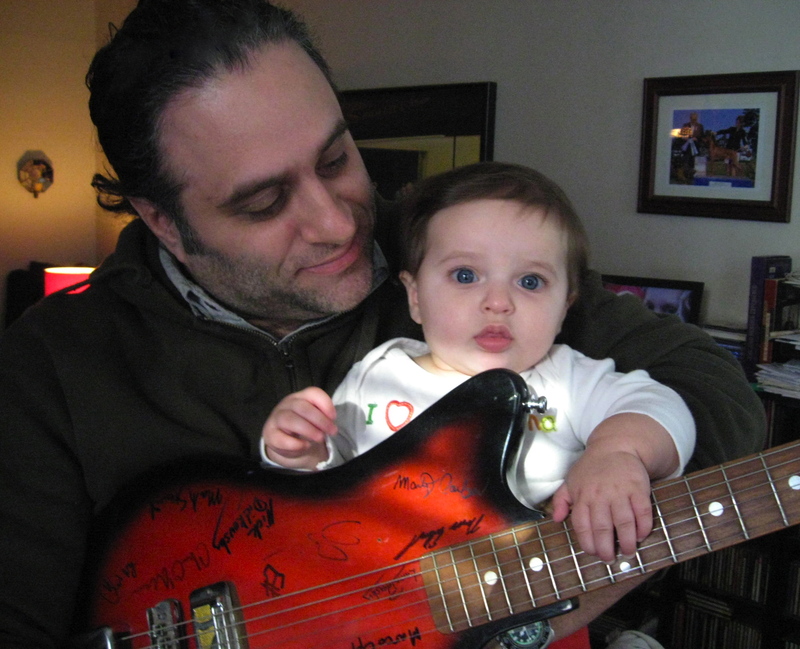 I was passionate about learning and wanted to learn how to play guitar. At the very beginning, I took some informal “lessons” with a family friend, learned a few power chords and took off from there. 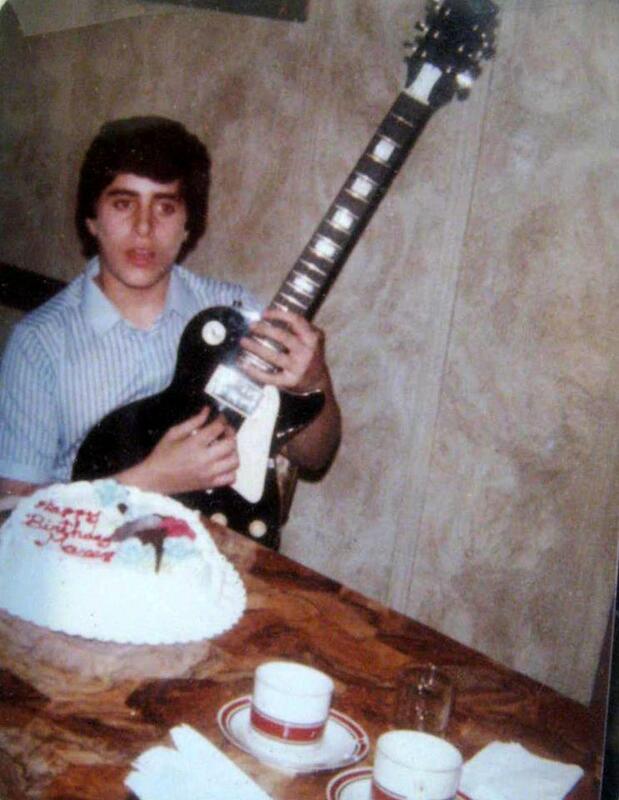 6 months into that, my uncle bought me my first electric guitar – an imitation Les Paul. I was so excited. Then about a year later, I took 6 more months of lessons with another family friend (who was actually quite good) and then basically became self –taught. My youth was spent listening to hard rock, heavy metal and 80s shred. I practiced at least 4 hours a day. In my later teens I discovered jazz and fusion. This was a time before kids had a plethora of after-school activities to choose from. Would that have made a difference for me? All I know is that I lived to play guitar. I would often fall asleep playing it. It’s all I wanted to do. I became one of those rock guitarists in my late teens who felt that I needed validation by learning classical guitar. There were many out there – longhaired metal heads plucking the nylon. (I didn’t have long hair though). 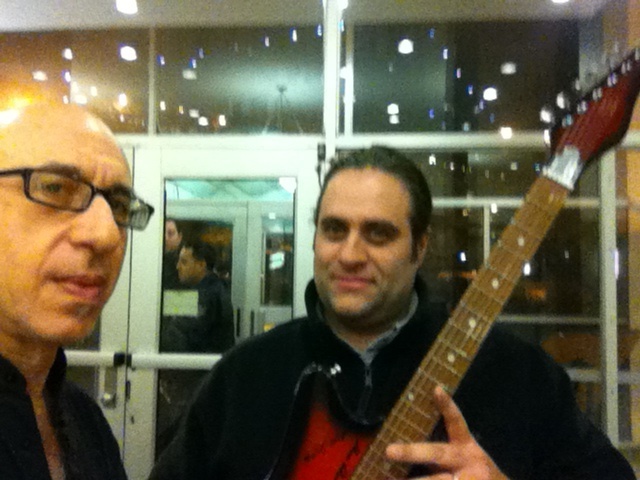 So, right out of high school, I enrolled into the Brooklyn College Conservatory of Music as a classical guitar major. After 2 years of studying classical guitar, I eventually switched focus and finished with a Bachelor’s Degree in Music Composition. I managed to get in the conservatory as a primarily self-taught rock musician. I didn’t have the type of music background many conservatory students had. My parents were hard working Italian immigrants. They would ask me to sing while playing and I could never do it seriously. So, I made fun of Italian style folk songs. I played only two chords (D and A7) and improvised lyrics in Italian and broken English. I wanted to play fast. I wanted to make noise. I loved feedback. I wanted to learn as much as possible about it. And as much as I loved the guitar, I learned that I hated it too. I fantasized smashing it into pieces. It was the perfect vehicle for my angst and sometimes it still is. I’m just not a kid anymore. Long story short; I went on to get a Master’s Degree in Music Composition. After traveling some winding creative roads and getting lost too, I became a composer and use lots of guitar in my music (I have 4 albums available). 30 years of guitar and I see myself as a composer first and foremost. Read some of my other blog posts to learn more about me and to hear my music. 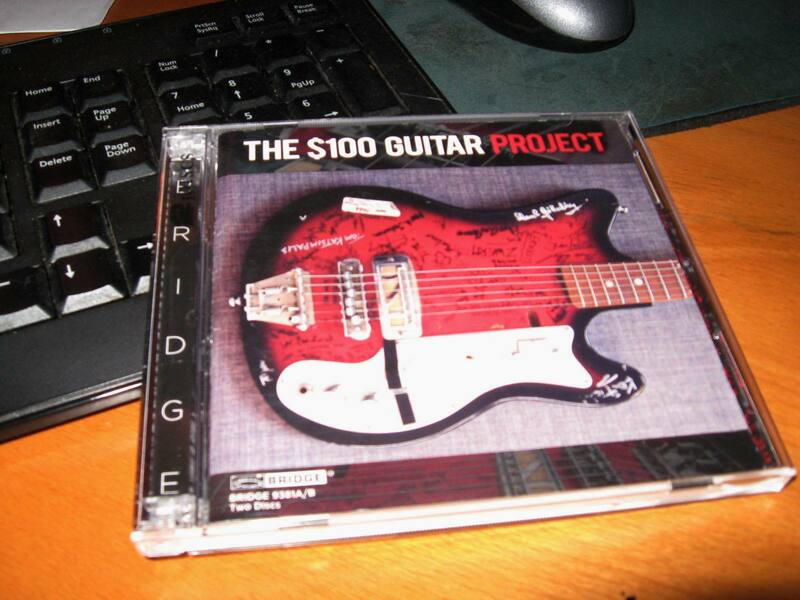 The $100 Guitar Project 2 CD was released on Bridge Records, Inc this January. 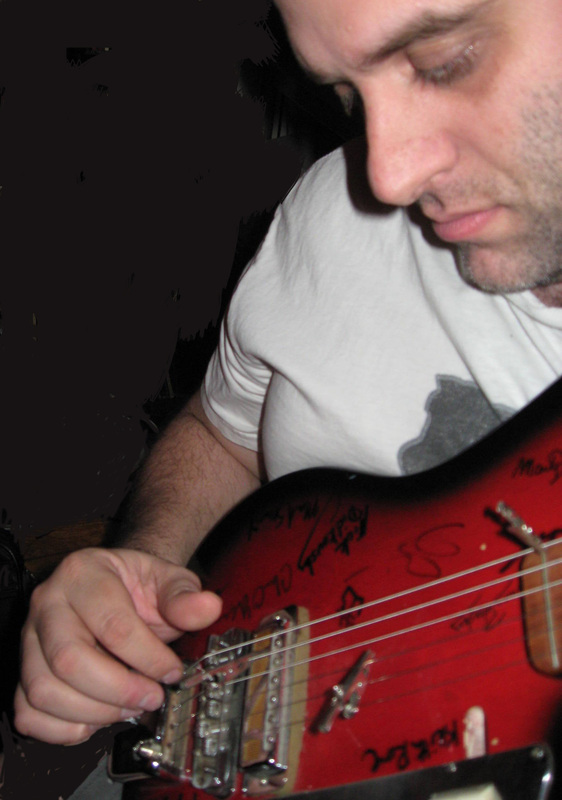 To read all about the project, go to: http://www.100dollarguitar.com. Also, important to mention is that royalties on every sale will be paid directly to CARE, a leading humanitarian organization fighting global poverty. It all started in October 2010 and I found about the project a month later. 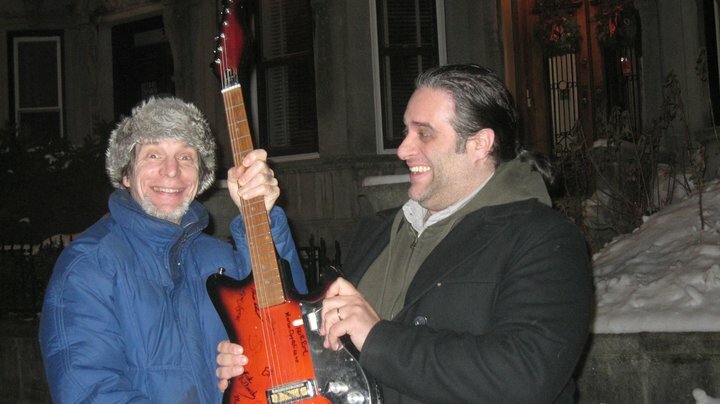 In January 2011, I picked up the guitar from Elliott Sharp in downtown NYC, had it for a week in Sunnyside, Queens and then dropped it off with Ron Anderson (PAK) in Park Slope, Brooklyn. I’ve always believed that the player makes the guitar. My first impression of the $100 guitar was that, yes, it was a real cheapo, but found that it had a good amount of resonance, was a bit quirky and a lot of character. I was taken aback by the unusually long headstock. Actually, I hated how that looked. So, I plucked around and thought, what kind of sounds can I get on this thing? After some thought, it came to me to compose a piece that incorporated all kinds of sounds from the instrument. This approach is not too far off from what I’ve done in the past. But with writing a short piece (a little over 2 minutes), I had to find a compelling way (at least to me) to demonstrate these sounds in a short amount of time without coming off contrived. 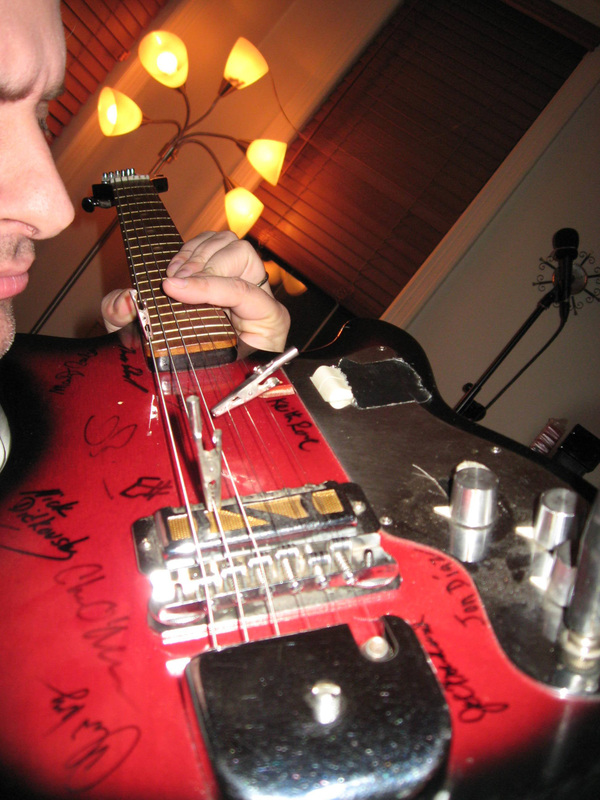 My signature right below the high E string – now slightly worn. After having listened to the 2CD a few times already, I am so impressed with what is a wonderful variety of music (65 players = 69 tracks. Wow). Special thanks go out to Nick Didkovsky and Charles O’Meara for coming up with this great idea. I enjoy visualizing that guitar being passed around having traveled over 30,000 miles and hearing all the great sounds coming from it. I got to see it again just a few weeks ago at the CD listening party in NYC. It still amazes me that it is still in one piece. Alex Skolnick, David Starobin, Elliott Sharp, Mike Keneally, Barry Cleveland, Fred Frith, Henry Kaiser, Mark Hitt, Keith Rowe, Nels Cline, Andy Aledort, Hillary Fielding, John Shiurba, Karl Evangelista, Phil Burk, Ray Kallas, Janet Feder, Thomas Dimuzio, Julia Miller, Chris Murphy, Chuck O’Meara, Marty Carlson, Shawn Persinger, Kai Niggemann, Steve MacLean, Ken Field, Roger Miller, Michael Bierylo, Bill Brovold, Larry Polansky, Biota Bill Sharp, Ava Mendoza, Amy Denio, Bruce Eisenbeil, Caroline Feldmeier, Colin Marston, David Linaburg, Hans Tammen, James Moore, Jesse Krakow, Jesse Kranzler, Joe Bouchard, Jon Diaz, Josh Lopes, Kobe Van Cauwenberghe, Marco Cappelli, Marco Oppedisano, Joe Berger, Mark Solomon, Mark Stewart, Mike Lerner, Nick Didkovsky, Rhys Chatham, Ron Anderson, Taylor Levine, Tom Marsan, Greg Anderson, Han-earl Park, Del Rey, Teisco Del Rey, Matt Wilson, Bruce Zeines, Toon Callier/Zwerm, Juan Parra, and Wiek Hijmanns. My first experience with drums and percussion in an electroacoustic piece was for a composition called “Kickstart” from my 2010 release, Mechanical Uprising. I have often referred to that piece as a composition for an “electroacoustic musique concrete avant rock band.” I’m still surprised it took me that long (about 11 years and 4 albums later) to get around to using drums and percussion in my own electronic music. The guitars were all performed by me and the piano music was composed by me. 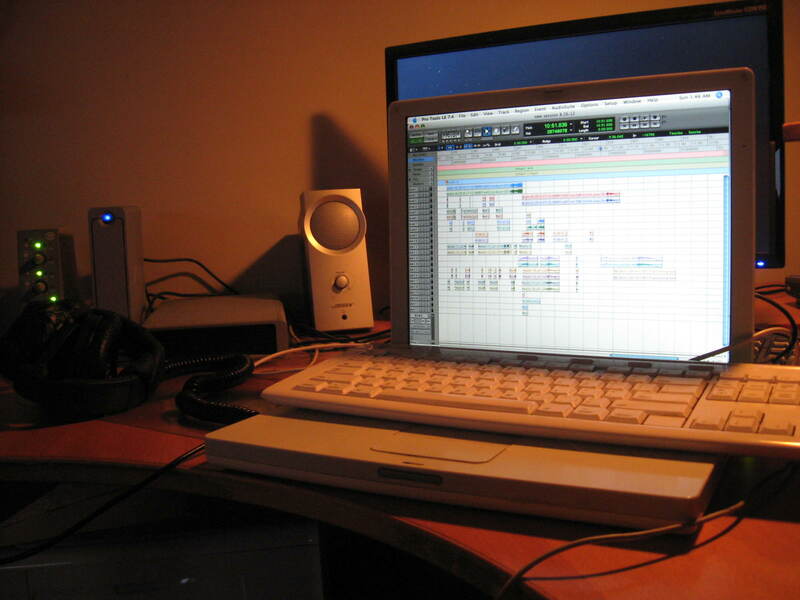 The drums and percussion sounds are samples from various sound libraries. These compositions will all be included on my next album scheduled for release in……….